The builders of Stonehenge I were using the Aubrey hole circle as a calendar, not just for keeping track of days and years, but eclipses and planets as well. They also kept track of a period of 72 years. This is close to the 71.667 years it takes to move through one degree of one sign of the Zodiac, but 72 years also figures in the cycles of Jupiter and Venus. It would take Jupiter 71.1708 years to go around the Sun 6 times. Venus goes around the Sun 8 times while the Earth goes around the Sun 5 times. It takes the Earth two days longer to complete this interesting cycle. Due to this ratio, Venus appears to draw a pentagram around the Sun every 8 years. The 5/8 ratio is also the Sacred Mean, Golden Section, or Golden Proportion, etc. This ratio can be seen in many things, including humans. Leonardo Da Vinci used this ratio in his artwork, the Vitruvian Man being an example of this ratio in mankind. Venus would take 72 years of 365.25 days each, less 18 days to complete 9 pentagrams around the Sun. The Saros Cycle was used in ancient times to calculate eclipses. This cycle was 18.03 years, 4 X 18.03 = 72.12 years. There was a very close conjunction of Venus, Jupiter and the Sun at Stonehenge in 3133 BCE. They rose together, Venus at 52° 05′ 25.1″, Jupiter at 53° 24′ 52.6″, and the Sun at 54° 05′ 22.1″. These measurements were taken from the centre of each orb, and after the Sun was standing on the horizon. Venus was over the Heel Stone. The blue lines in the diagram below show the positions. For six mornings these three rose close together, Jupiter slowly pulling ahead. That first really close day, Mercury rose almost two hours ahead of them, the Messenger of the Gods. Then Enlil (Jupiter), and his twin grandchildren Inanna (Venus) and Shamash ( the Sun) rose in a nice wee group. Five hours later Mars comes along, the rear guard, the warrior. The night before, the full Moon rose at 9:15 pm at the orange square, and the Milky Way was behind the Heel Stone, which had Menkalinan directly above it. All and all, it was quite magical, and it is easy to understand how whole histories became attached to these planets, the Sun and the Moon. This event would be handy to start tracking the cycles of Jupiter, Venus, Mercury, Mars and Saturn, he shows up late in the afternoon of the first day of the really close conjunction. Each one of those cycles could have been counted on the Aubrey hole circle, you would just have to know exactly where they all rose that day to start keeping track of them. One marker for each planet, and when they had each done their cycle, you would know how long it took for each one. A very handy device, the Aubrey hole circle. The Friar’s Heel Stone is believed to have been named Freyja’s He-ol Stone at one time. He, is Welsh for, to sow, and ol means, track. So it is Freyja’s To Sow Track. Unless the word was actually, heol, which is an obsolete Welsh word for road. So it could be Freyja’s Road instead. Freyja has her root in the Sumerian goddess Inanna, who seems to have been the original triple goddess. She is connected to the planet Venus and the constellations Virgo ( Ab Sin in Sumerian), and Gemini. Her twin brother was Shamash the Sun god, her father was Sin, the Moon god, and her grandfather was Enlil, Jupiter. There are other places which take in account Venus’ movements. Newgrange, in Ireland, Bryn Celli Ddu in Wales, and Maeshowe in the Orkneys. Likely there are other places in the UK and Ireland also which would have kept track of her. She was a favourite in Mesoamerica and South America, which do seem to have strange connections to things in the Middle East and Egypt. Astronomy was practiced heavily in that area, the Mayans and Incas are quite well-known for this. The date of this conjunction fits very well with the beginning of construction at Stonehenge. At the moment, it is believed to have been started between 3200-3100 BCE. The purple diagonal line coming from the rectangle, shows the Winter Moonrise Minor point in 3000 BCE. Since this sight line had only moved about one-third of a degree by 2500 BCE, it was saved when the Temple was built. You could stand against Sarsen 1, and sight over Z1, Y1, Aubrey hole 1, and on to the two posts on the bank of the Avenue. This being Winter Moonrise Minor, it was an important spot. If the full Winter Moon appeared in this area, there would be an eclipse of the Moon and/or the Sun at both the Spring and/or the Fall Equinox. Originally, I chose these Aubrey holes, thinking there may have been two cycles of 72 years being kept track of. If you were counting the years clockwise on the Aubrey holes, one cycle would go from Aubrey hole 1, all the way around the circle and on to Aubrey hole 16. This would be 72 years. The second cycle could have started at Aubrey hole 29, and ended after 72 years at Aubrey hole 44. Finding out that this was Winter Moonrise Minor in 3000 BCE was both coincidental and highly surprising. I felt that there was something important about this rectangle and its diagonal, but the posts on the bank are not numbered or lettered, and no one ever seems to mention them. However, the diagonal line cuts the corners of the rectangle into 48° and 42° angles, a ratio of 8/7 = 1.1428571, which is the same ratio as the maximum Earth-Moon distance/minimum Earth-Moon distance. Seems those posts on the bank were important after all, very important. Astronomy had been practiced there for several thousand years before the Aubrey hole circle was created. Those first posts on the Equinox line attest to that. Just because there was no megalithic building going on in 7000 BCE, doesn’t mean that these people weren’t using some other sort of markers for all those important events. Important events and the heavenly bodies used as points of reference have changed over time, it would be impossible to say just what these people kept track of. Large portable rocks may have been used instead of permanent markers, just as they may have been used at other henge monuments containing no large standing stones. They aren’t there anymore because they were probably removed to be used for something else. These people didn’t just build the Aubrey hole circle on a whim, they were well-educated in astronomy and surveying. The very first line strung for the Aubrey holes was on the Equinox line. This henge monument may just have been a technical improvement, rather than the beginning of astronomy there, which seems to have been practiced there for four thousand years before it was built. Even the Windmill Hill people had been in the UK and Ireland for over a thousand years, perhaps two thousand. They would have been well acquainted with the night sky in that area by then. This may be true for other henge monuments and stone circles. There are stone circles made out of boulders and henge monuments with no standing stones. They may all have started as plain circles made from large rocks and/or posts. 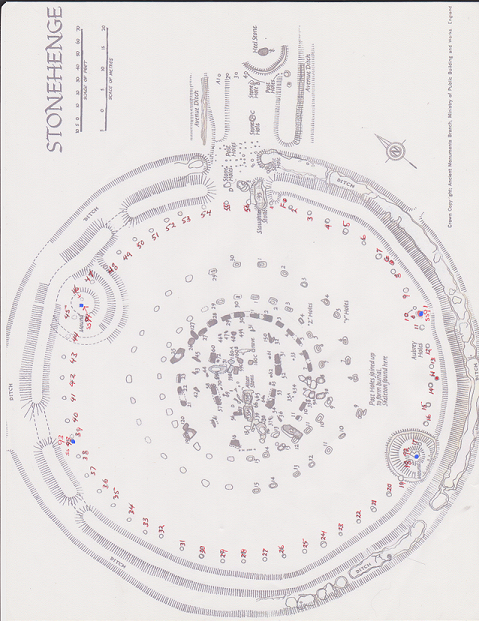 The henges and standing stones being a later, more permanent version of the original. Stonehenge was just the most elaborate. Not all these circles have the same amount of stones, and not all stones seem to line up with anything happening in the sky, at least not that we’ve found so far. All of them were used for astronomy and calendar keeping, including the causewayed camps. Not all are circular, some are flattened on one side, others are egg-shaped. Some may have been very simple, keeping track of the Moon and the eight divisions of the year, while others may have been more elaborate with eclipse tracking. The Windmill Hill people seem to have been the originators of all of these, including the Temple at Stonehenge. We seem to be missing a very large portion of history in the UK and Ireland. Very important history. All ancient astronomers kept notations of some sort, and in the UK and Ireland we may be seeing a standard practice. Build a calendar ‘circle’ for keeping track of the sky, then keep notations on a ‘circle’ drawn on bark, hide or a slab of Beech. This way the astronomer/surveyors could compare notes, so that they could gain more knowledge, not only about the sky, but how big the landmass was that they found themselves on. Unfortunately, their notations rotted away long ago, and their monuments have stood silent for thousands of years. It’s quite likely that these places were used for more than astronomy, such as rituals to do with the festival days, marriages, last rites, etc. They may have been weekly market places, clinics, law courts, or perhaps meeting places for clan chiefs and their retainers. Perhaps they were considered neutral ground. Circle casting traditions likely had their beginnings with these places. When circles are cast, they should be thought of as bubbles standing outside of time, a place separate from the surroundings, which is what all henges do, they separate the area within from the area surrounding it. The Aubrey holes have always remained a mystery. Cremated remains were found in many of them but not in others. Great pains were taken to place these holes the same distance apart, although they are not all the same diameter, and they were not all placed in the correct spot. But that’s only human, I suppose. It isn’t known whether any posts made of wood or stone ever stood in them, although they did use some of them when they surveyed for the Temple. There is a debate about this subject at the moment, because it is thought that one of the holes has compacted chalk at the bottom. The hole in question is Aubrey hole 7, which has recently been excavated again. This has led to the theory that Bluestones once stood in them. However, since Aubrey hole 7 was used to hold a post in connection to laying out the Temple and the Y and Z holes, this compacted chalk could just as well have come from a wooden post, they didn’t need the Bluestones for that. Either way, it makes no difference to the calendar. First let’s look at the number 56 which is an interesting one. It can be divided 2 x 28, 4 x 14, 8 x 7. It also gives the 19, 19, 18 and 10, 9, 9 cycles associated with eclipses there. 6.5 x 56 = 364 which is only one day short of one calendar year. The Winter Moon travels back and forth across the Avenue over a period of 18.6 years. When standing in the centre of Stonehenge today, and sighting over D or F, the full Winter Moon appears at these locations in a cycle of 19, 19, 18 years. It appears over the Avenue in a cycle of 10, 9, 9 years. If the full Moon closest to the Winter Solstice appears either over D or F, there will be an eclipse of the Sun and/or the Moon at the time of the full Moon closest to the Spring and/or Fall Equinox. If the full Moon closest to the Winter Solstice appears over the Avenue within a space of about 7°, there will be an eclipse of the Sun and/or Moon at the time of the full Moon closest to the Winter and/ or Summer Solstice. There was an eclipse of the Moon there on June 25, 1964 which appeared between the uprights of the Great Trilithon, or at least it would have if one of its uprights wasn’t lying on the ground now. The above markers, D and F, were not being used for this sighting in 3000 BCE. Winter Moonrise Minor was on the purple diagonal line and Moonrise Major, which sits almost 20° northwest has no marker at present except the end of the inner bank. The midway point would have been to the right of post hole 3A. Summer Solstice Sunrise would have occurred to the right of post hole 4A. The Heel Stone would have been a quarter mark, 5° from the Moonrise Minor point. If the Moon was travelling back northwest from its Minor position, once it got to the Heel Stone, it would be in the zone for eclipses. But the Heel Stone also kept track of Venus, which passes between the Earth and the Sun every 584 days. Ten times around the Aubrey hole circle plus 24 days. It was likely used to keep track of Jupiter, and perhaps the other planets and major stars. These people seem to have liked multi purpose things. So how did they do it? The years were counted clockwise on the Aubrey holes, starting at Aubrey hole 1, and the days were counted counter-clockwise on the spaces between the Aubrey holes. In this counting of days, the Aubrey holes represented Sun up (a day spot), and the spaces in between represented Sun down (a night spot). Before any counting started, the operators would have to wait for the proper day. In Gerald S. Hawkins’ book “Stonehenge Decoded” there are tables showing eclipses of the Sun and Moon for a period of years between 1592 BCE and 1452 BCE. (1) (2) In that time period there were three eclipses of the Sun on June 21st. My guess is that they started their count on the evening of June 21st, close to a day or night of a Solar or Lunar eclipse, starting a cycle of 10, 9, 9 years, which would mean that the full Moon the winter before would have been over the Avenue in the danger zone. In 3154 BCE, there was a partial eclipse of the Sun on June 21, this may have been their starting day. Since the biggest reason for watching out for eclipses in ancient times, was to make people believe that the shaman/priest/priestess controlled this event, not only would the population be awed at this display, but it would give the perfect start for the operators, particularly since it was only a partial eclipse. Wonder, did the ones in charge brandish their green stone axes at it? But that story is for another time. During the first year of our lives, only the days, weeks and months are used to give our age. We don’t turn one until 365 days have gone by. And so it was at Stonehenge. So let’s begin. On the first day, June 21, the Sun came up, and that evening a marker was placed between Aubrey holes 28 and 27. Aubrey hole 28 represents the first Sunrise, Aubrey hole 27 the second Sunrise. The marker between the holes was used to count the days. Three and a quarter turns counter-clockwise around the circle from the starting point 28-27, will put the day counting marker between holes 15-14. You have now counted 182 days. The next evening your day marker will be between 14-13. The next morning you will have the Sunrise of the Winter Solstice. Today, from Station Stone 93 to H marks the Sunrise of the Winter Solstice. H sits between 14-13. In 3000 BCE this event would have happened a few degrees to the northeast, but your counter would still be at H, letting you know that this was the Winter Solstice. There would have been plenty of time to get prepared for the festivities, since the folks in charge could have told everyone how many days it would be until Winter Solstice. Six and a half turns around the circle from the starting point 28-27, will put the day counting marker between 1-56. As the operator of this calendar, you will know that 364 days have gone by. One more day and you will have completed one year. Every four years, two days would be added to make up the leap year. This would keep the calendar almost in line with the 365.2422 days of the correct time of one Solar year. On evening 365 of the first year, a marker is put at Aubrey hole 1, this is to mark the first year. Every year after completing the count for one year, the day counting marker goes back to its original position between 28-27. The markers counting planetary cycles would continue on, until they had figured out how long each cycle was. Some cycles are short, such as Mercury and those would have been counted in days, but as soon as they had figured out the 11.86 years for Jupiter, they would switch to counting its cycle in years and days. Since 72+ 56 = 128 there’s a good chance that the people at Stonehenge were omitting the leap day in year 128. They may have had two cycles of 72 years going. One marker would have been used for the first 72 years, going from Aubrey hole 1 all the way around the circle and stopping at Aubrey hole 16. At the end of year 73, a second marker would have been placed at Aubrey hole 29 to begin a new 72 year count while the first marker is busy counting to the 128, which it will achieve when it gets back to Aubrey hole 16. Every time year 73 comes around, the new marker will change starting holes. First cycle starts at Aubrey hole 1, the second cycle at Aubrey hole 29, then 1 again, then 29 again, etc. I think they may have done just that because of the way the Aubrey hole circle is laid out, and that magic number 56, which comes in so handy, 6.5 x 56 = 364 and 72 + 56 = 128. Venus, 584 days, (10 x 56) + 24 = 584, eclipse cycle 19 + 19 + 18 = 56, or (10 + 9 + 9) x 2 = 56. The ancient Mystery School number sixteen, 16 + 56 = 72. The red dots are the four Station stones, two of which have mounds and ditches, unlike the other two plain Station stones. The green dots belong to the eclipse cycles, and the blue dots are the two 72-128 year spots. The period of 10, 9, 9 years has been mentioned in connection to the eclipses. If the year count started at Aubrey hole 1, then Aubrey hole 10 lies just before Station Stone 91. Nine more years would put you at Aubrey hole 19 which lies on the ditch on the SW side of Station Stone 92. The next 9 puts you at Aubrey hole 28, and the next 10 at Aubrey hole 38 which lies SW of Station Stone 93. Nine more years will put you at Aubrey hole 47 which lies close to the ditch to the NE of Station Stone 94. Nine more years puts you at Aubrey hole 56. For the first 72 years, one marker counted days, a second marker kept track of the years. Although there is more to eclipse cycles besides keeping track of the 10, 9 9 and 19, 19, 18 years, most of that could have been kept track of just by observing the position of the full Moon at the time close to Winter Solstice. This time difference holds true for a Solar eclipse also. If the Moon rises too long before Sunrise, the Sun doesn’t have time to catch up to it. If it rises after Sunrise, then there will be no eclipse. If the Moon rises too far to the left or right of the ecliptic, on which the Sun sits, there will be no eclipse. By combining their observations of the Winter Moon’s position over the Avenue, keeping track of the years, and watching when the Moon rose and the Sun set, for a Lunar eclipse, and watching how long before Sunrise the Moon rose, would give them plenty of information to predict the eclipses. They wouldn’t need to be calculating the exact number of days. After the first 72 years, the marker would be at Aubrey hole 16, and some sort of tally mark would have been placed here to keep track of these periods of 72 years. Since each sign of the Zodiac takes up approximately 30°, it takes approximately 2160 years to pass through one sign of the Zodiac. Although 72 and 2160 years are usually given, the actual time is closer to 71.667 and 2150 years, but in ancient times 72 years was fairly standard. In mythologies and religious texts, this number 72 is mentioned again and again. Pieces of chipped flint about the size of a fat cigarette were found with the cremations in the Aubrey holes. These may have been their tally sticks. Since Aubrey hole 16 lies NE of Station Stone 92, it would be easy to stick one of these tally marks in the chalk of the ditch surrounding this Station Stone. If you were using two cycles of 72 years and your cycle started at Aubrey hole 29, you would end at Aubrey hole 44 where there is a ditch and mound surrounding Station Stone 94 also. After placing 15 tally sticks in the ditch at Aubrey hole 16, and 15 tally sticks at Aubrey hole 44, you will have completed one sign of the Zodiac. Using the above method would put you ten years passed the completion of one sign of the Zodiac, but the constellations connected to these signs don’t all take up equal amounts of space in the sky. These people may not have been using our constellations. They were well enough acquainted with the night sky if they needed to make an adjustment at some time. This is only a very simple calendar, but these people were likely keeping track of the planets and other prominent stars also. I just haven’t ferreted them out of the astronomy program yet. I’m still working on the eclipses, for which I think they may have had a special device constructed. The people whose cremated remains are in the Aubrey holes, were quite likely the people who kept track of the calendar, and they were likely the teachers. I would think this inside area would be reserved for those people who worked there. In fact, only certain people may have been allowed into the complex. School for young Dodmen, astronomers, counters, sailors, geologists and ‘travellers’. The travellers being people of a certain class, looking to gain new knowledge. Geologists, because the first thing educated people do when arriving in a new, practically empty land, is look for the wealth. At that point special types of rock and ores were being looked for. Ruis or Rowan, one of the Ogham letters, was used for metal divining. Sailors because you need them to catch fish, and for trade, particularly if you are on an island. It’s easier to sail around the coast, looking for rock, than it is to do so on foot. Sailors came with the Windmill Hill people, and likely stayed sailors, whether to go back and forth across the Channel, or scout around the coast, and fish too while they were at it. But sailors needed to understand astronomy, and navigation, which they could have learned at Stonehenge. When the big white bank was new, it was at least six feet high. This would be an extremely good backdrop for those people learning their first lessons in surveying. There would be no background distractions, and the place was big enough to construct almost any type of geometrical configuration. Perhaps the Aubrey holes were used for that also. The great white bank gave privacy, this type of knowledge wasn’t meant for everyone at that time. All these things would have been part of the Ancient Mysteries, most of which were closely kept secrets. A few spearmen would have kept guard at the fairly narrow openings. I don’t think any kids were playing football in there. It’s possible that no festivities went on there at that early stage. 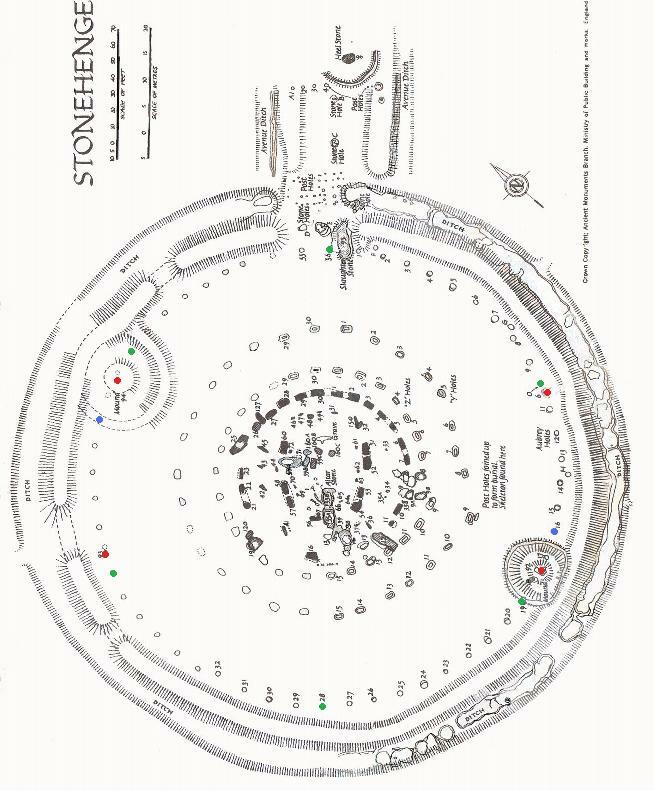 There are no traditions of dancing taking place at Stonehenge as there are with some other circles, but it would be a great place to learn about surveying and astronomy. Stonehenge was a serious place from the beginning, all the fun stuff took place elsewhere, at least until the Temple was built. Then it became very popular with the population. The people who designed this place were incredibly clever with numbers and astronomy, but the people operating the calendar just needed to keep count of the separate cycles. Many other things were marked on the circle. For instance, when your marker was at H, the Winter Solstice Sunrise happened the next morning. The mounds and ditches around the two Station Stones were there to keep track of the 10,9, 9 and the 19, 19, 18 year cycles, and the 72 -128 year cycles. In the 10, 9, 9, cycle, the first 10 is before a plain Station Stone, the first 9 is SW of the mounded Station Stone 92. I’m surprised that there is no marker at Aubrey hole 28, this would tell you when you had completed the first 10, 9, 9. As you carry on, the second 10 in before a plain Station Stone again and the second 9 is NE of the mounded Station Stone 94. These mounds and ditches around the two Station Stones would also help you to know when you had completed the 72-128 year cycles. If your cycle started at 1 then after 72 years, you would be at Aubrey hole 16, NE of the ditch around Station Stone 92. If you started your cycle at Aubrey hole 29, you would be at Aubrey hole 44 which lies SW of Station Stone 94. The markers for each separate cycle would be on opposite sides of these Station Stones. The people, who were the architects of Stonehenge, knew exactly what they were going to do before they ever started. After all, they had several thousand years to figure out all the astronomy involved. No one stood around scratching their head at any time, wondering what to do next. This whole complex could have been built in less than two months. It is estimated that 3500 cubic yards were removed from the ditch to create the inner bank. After experimenting with this, it was found that one man could remove one cubic yard per day, and probably only one helper would be needed to move the chalk, since the digging wasn’t exactly speedy. With a hundred men digging and a hundred helping, the bank could have been finished in thirty five days, weather permitting. The surveying for the Aubrey holes may have taken a week, after which other men could have started digging these and creating the mounds and ditches for Station Stones 92 and 94. There may be something in the Welsh language which comes directly from Stonehenge. English, week = Welsh, wythnos, which means eight nights. It is understood that it is the days in between which are counted. Since the day counters were not moved until Sundown, and if one looks at Station Stones 91-92, it can be seen that there are eight nights with seven days in between. The word for fortnight in Welsh is pythefnos, which is a contraction of pymtheg nos, fifteen nights with fourteen days in between them. If you swing the line 91-92 NE or SW, and include the original set of seven days between eight nights, you get fifteen nights with fourteen days in between. At this point I have to question whether fortnight is a contraction of the Anglo-Saxon fourteen nights. What if it actually started as a fourth night, a two week period will give you one-fourth of the Aubrey hole circle. The whole thing was ingenious, took a minimum of labour, used the most basic materials and was environmentally friendly as well. The most amazing thing about it, is that it could be started up again today, and we could use it just as the Neolithic people did. Gerald Hawkins called it a computer, but there is no computer in our modern lives which will last five thousand years. One thing these people seem to have been interested in was permanence. The proof of this calendar lies in the Aubrey hole circle, and the way it was set up with its Station stones and its 56 Aubrey holes. Whether they ever had posts or stones in them at one time, doesn’t matter. The calendar could still be counted there. It all works like clockwork, is this a coincidence? I have my doubts. This would have been the most accurate calendar of its time. I am totally in awe over the skills these people had. I think this whole place was unique to England. They were keeping a Solar calendar, a Solstitial one, whereas many other people were keeping a Lunar or Equinoctial one. However, at Stonehenge they were keeping track of the Moon as well as the Sun. When the Temple was built it was Solstitial, while in the Middle East we still find Equinoctial ones being built. The early Romans had a Lunar calendar, and not a very good one at that. I have to wonder whether Ahknaton knew of this place, and turned suddenly completely Solar. This entry was posted in Ancient History and tagged calendar, Stonehenge.